My friend and I go to Skewers a lot and I LOVE, love, love their lighter side menu options. I was having friends over for dinner and craving middle eastern / mediterranean food. So this dinner menu was inspired by my lovely girly dinners at Skewers. My dinner party menu consisted of chicken, tabbouleh, hummus, tzatziki and pita bread. 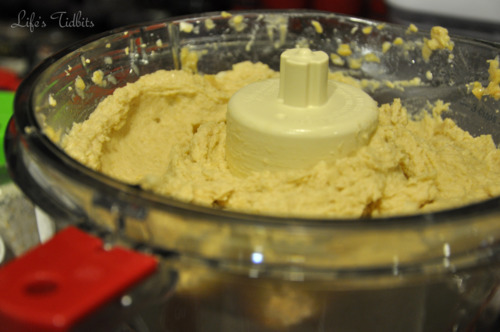 I’ve already blogged about my hummus recipe, check it out and then come back to this recipe. 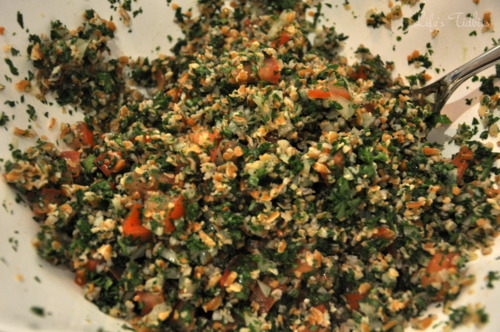 The tabbouleh is a little more time intensive then the hummus, but it is super easy to make. So without further ado here is how I make the tabbouleh. 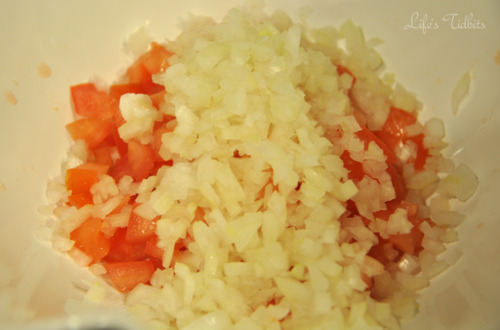 Dice the tomato and onion. Place them in a bowl. 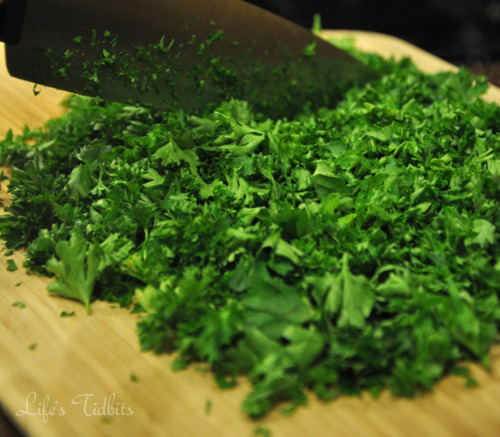 Chop the curley parsley and mint. 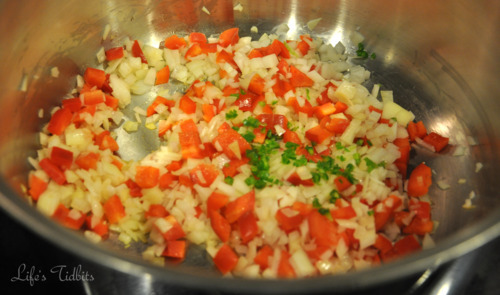 Mix the bulgur, tomatoes, onion, parsley and mint in a bowl. Add lemon juice, olive oil, salt and pepper and mix well. Serve immediately or chill in refrigerator for 2 hours before serving. I prefer to have it chill in the refrigerator for at least 30 minutes so all the flavors can develop. Coming up next for our middle eastern inspired meal is the tzatziki sauce and then the chicken. 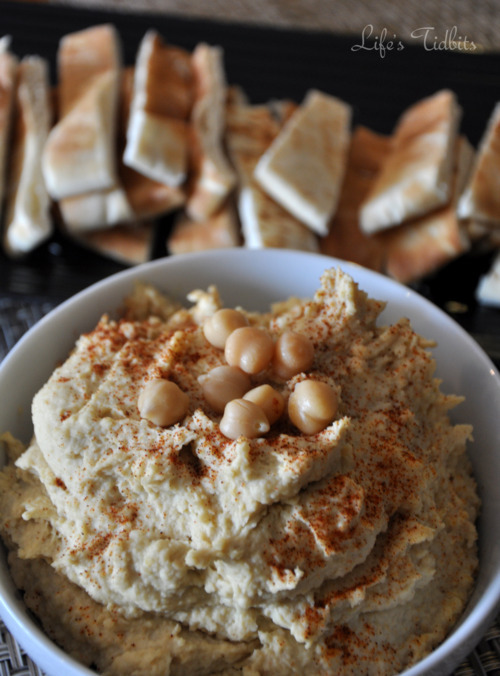 I took a number of different recipes from online and came up with this yummolicious hummus!! It is a prefect party item, appetizer or food to bring to a football viewing. 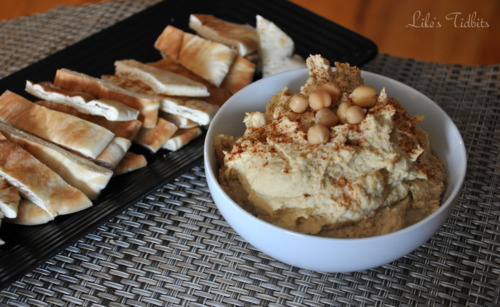 Here’s how the hummus comes out and it takes less than 15 minutes to make! 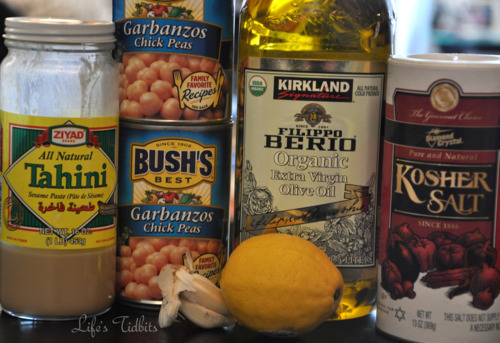 Put all the ingredients in the food processor (except the olive oil). Start processing and slowly add 1-2 tablespoons of olive oil at a time. Unfortunately when I made the hummus this afternoon I eye balled the olive oil until it looked/tasted right. If you’ve purchased hummus from the store or ordered it at dinner you will have no problem with assessing if you’ve added enough olive oil. 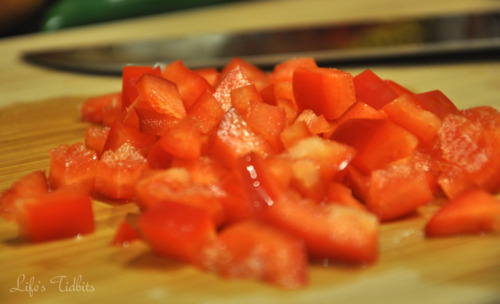 Once it is done place it in a bowl and refrigerate for 15 minutes or more. The hummus can be served chilled or at room temperature. 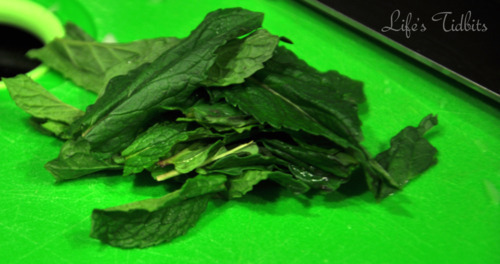 It tastes great with pita bread, carrots, chips or really any vegetable. Add a little paprika and the chickpeas you reserved as a garnish. You can also add a little extra olive oil on top if desired. Brrrrr it’s cold out there and today was the first snow fall of the year!!! 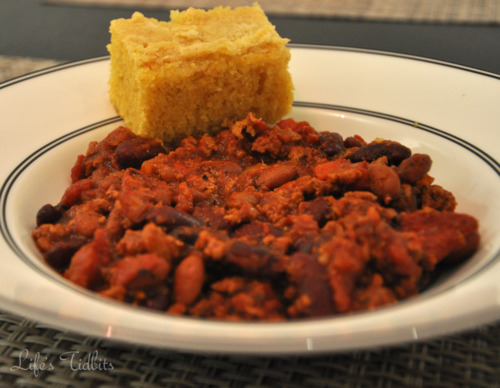 Cold weather = chili night at our house and to be specific turkey chili! My husband swears he’s going to be made of turkey, because of how many turkey based meals I make. LOL. He cracks me up. Chop the red pepper and drop it into a big enough pot to hold all of chili. I like to add a little vegetable oil to make the veges soften quicker. 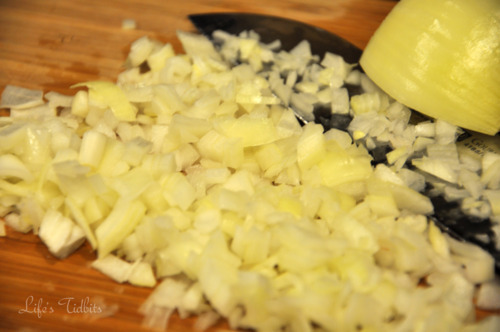 Then chop your jalapeno, garlic and onion and drop those in as well. Saute until they are tender. In a pan over medium-high heat ground turkey. Break into small pieces and cook until browned. Drain off any excess fat. Once the vegetables are cooked add the turkey (or beef) to the big pot. Next, add in Worcestershire sauce, hot sauce, and beer (I usually use water and to me it tastes the same). Then add chili beans (with the sauce), kidney beans, fire roasted tomatoes and tomato paste. Season with chili powder, oregano, cumin, salt, pepper, cayenne pepper, and paprika. Mix well. Cover and simmer for 1/2 hour stirring occasionally. Makes 6 servings. If you have left overs it makes for a fabulous lunch the next day or later in the week! I served it with homemade corn bread and it was YUMMY! Happy Hanukkah (or Chanukah depending on your spelling preference)!!! This year my friend who usually hosts a Hanukkah party decided to go on a vacation with her sister and mom. I mean really how dare she go away without providing me with potato latkes before she left. 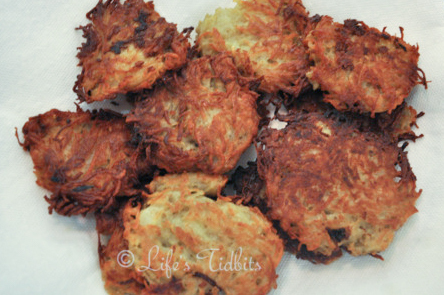 =) So this meant I would have to make my own potato latkes for the first time ever. This recipe is super easy and if you have a food processor / Cuisinart it is like a hop skip and a jump to the frying pan. 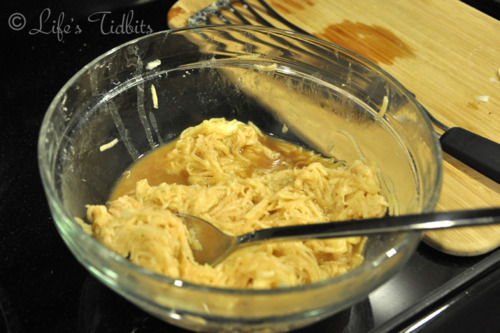 You will also need apple sauce and sour cream to serve with your potato latkes, and I guess if you are my husband then hot sauce should be on the table as well. Hot sauce is new one for me and I would say skip it, but he insists it tastes good. 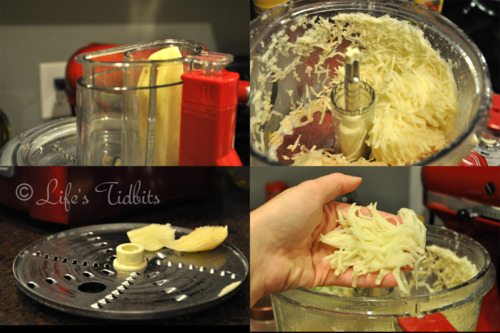 Using a food processor or a box grater shred the potatoes and onions. The food processor saved me a ton of time and makes it so easy! I got to use one of the attachments for the first time, which is always exciting (it’s the small things, right?!). Transfer them to a colander and squeeze dry. 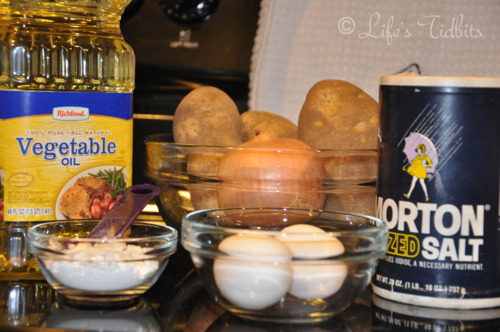 Mix the potatoes and onions with the eggs, flour and salt. In a skillet, heat 1/4 inch of oil. Drop about four tablespoons for the mixture into the skillet and press lightly to flatten them. Cook over moderately high heat, turning once, until browned and a little crispy. It should be about 6 minutes. I found that a fish spatula worked really well for flipping these babies and not messing them up. Just randomly grabbed it, but thought I should pass along the tip nonetheless. 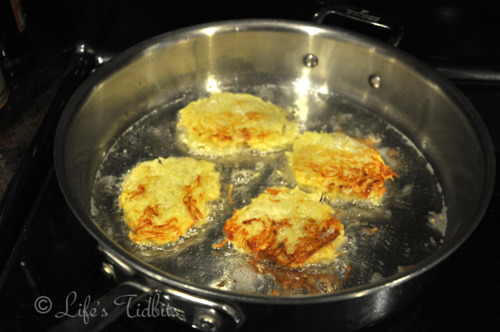 Remove from skillet and place the latkes on paper towels to drain the oil. It makes about 12 latkes. And take a look … Voila! MAKE AHEAD: The potato latkes can be at room temperature for up to 3 hours. Reheat on a baking sheet in a 350° oven before serving. If you plan to reheat them remember that they cook a little extra in the oven so don’t over fry them. 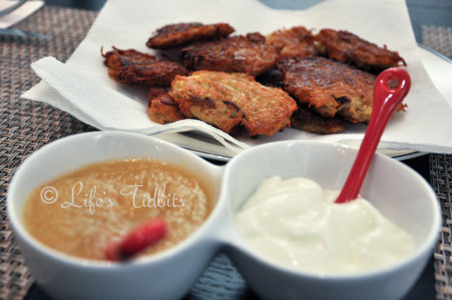 Just writing this blog makes me want to go reheat the extra latkes and eat them! Anyways put some sour cream (I prefer light as it is less fat but still tastes great) and apple sauce on the table and serve. And seriously how cute is that double serving bowl? Thank you wedding guest and Crate and Barrel’s Registry.